Of late I have been involved in a lot of conversations around user experience, especially since the last few months the sessions at the RefreshPhilly group that I am involved in have had quite a number of speakers on that topic. Speakers on UX usually come from a design background which isn’t surprising. The opinion I sometimes find prevalent and which I strongly disagree with though is that user experience is solely a design concern. This is what I feel is one of the biggest misconceptions in our industry. Recently, Grant Skinner, one of my favorite Flash developers, gave a talk at the FITC Amsterdam conference. Though I didn’t attend the conference, I did browse his presentation online. One of his slides had the diagram shown below. That pretty much hit the nail right on the head. And thats exactly my take on it. I think technology has a huge contribution to user experience. However traditionally that has not really been recognized as much. I think there is a real need for the Creative Technologist. As technologists we understand whats possible with the current and the cutting edge technologies, which enables us to truly understand the problem statement. More so now when online landscape includes more than just technologies like Java, Flash, etc. What do the new platforms like Facebook, Yahoo Open, OpenID bring to the table? Look at how the labs features in GMail improve user experience. How about browser extensions like Gears that could let enhance the user experience by letting them take your online content offline for reading later or BrowserPlus that could literally allow you to trigger the speech command on the local operating system and have it read out the content text for him. And Creative Technologists have started becoming less rare to find on the web. Another article I recently read on the Read Write Web blog was on the fantastic Enjoysthin.gs application built by Ted Roden who is now employed by NYTimes as a Creative Technologist. While Creative Technologist is still not a title that gets any results in Monster.com, I wonder if that’ll change soon. Great stuff. You really need that blend of technology and design. I recently switched from Tivo, to another DVR, and while I have all the same functions the weak UI, and poor flow ruin the experience. 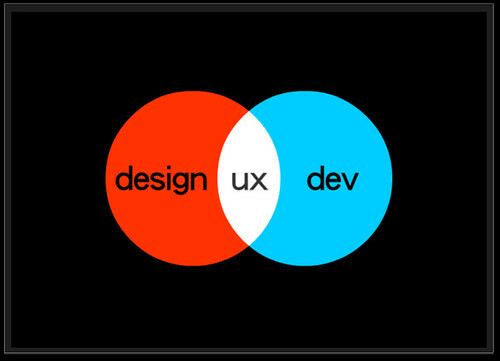 I want to put that venn diagram picture in the cube and office of every developer, designer, and project manager of every software company in the world. Previous Previous post: RefreshPhilly March event is tomorrow!